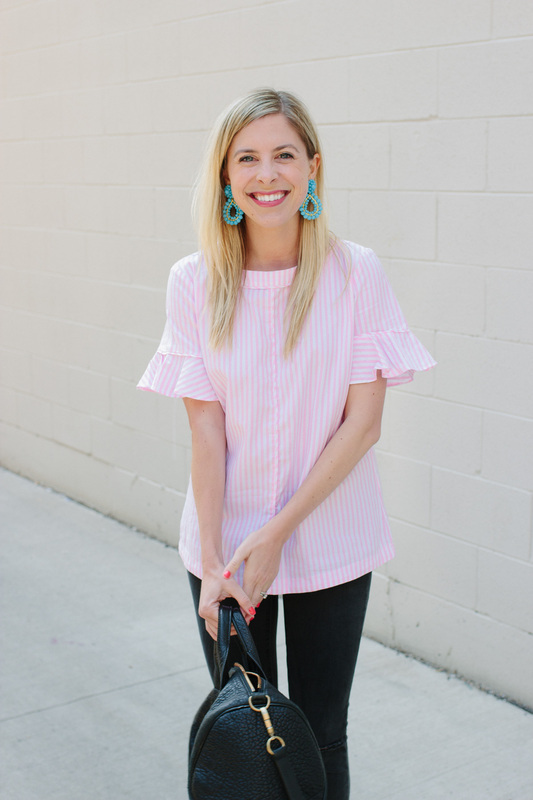 I mentioned my new shopping rule on Instagram when I bought this top at Banana Republic: If I buy something and don’t want to wear it the next day or have an event/trip I’m planning to wear it for, return it. Otherwise it ends up sitting in my closet with the tags on, and then I eventually feel bad enough and wear it once and then it sits there all over again. 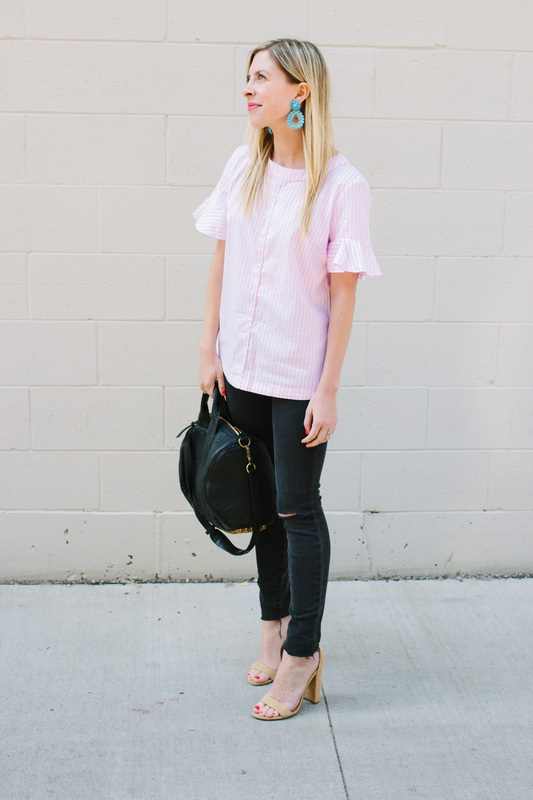 I’ve mentioned it before, but I used to have some pretty bad shopping habits – loving an item but buying it in the wrong size because mine wasn’t available or thinking a sale was too good to pass up and buying something super trendy spur of the moment. Before I buy something now, I try to think through how many different pieces in my closet I can wear it with. I want it to be extremely versatile. Can I take it from work to the weekend? Can I wear it for a bridal shower, baby shower and a wedding? When I’m online shopping, I’ll add an item to my cart, and leave it for three days. If I don’t think about it during that time, I remove it from my cart. If I’m still thinking about it, I wait for it to go on sale and then buy it. I really hate paying full price. If I do end up paying full price and a sale starts within a week, I typically call the retailer and try to get a price adjustment. I’ve worn this top with skinny jeans (wearing this pair in my Instagram post – a splurge that I talked about in this post), my pleated faux leather skirt (last seen here) and an A-line skirt. It’s sadly sold out, but I’m still including the link below because I like to check back and see if a few sizes become available again. I love this similar version at J.Crew. 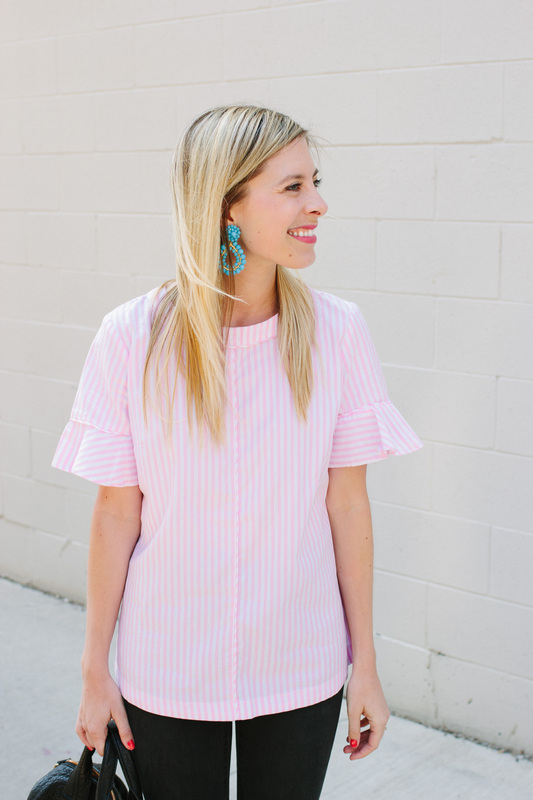 I’ve been gravitating towards studs when it comes to earrings, but the warm weather we’ve been having has me wanting to have some more fun and wear statement earrings for spring. Since I try to purchase items I can style multiple ways, having a variety of accessories really helps update my outfits. When I’m looking for a new pair of earrings, I tend to frequently visit J.Crew and Tuckernuck. BabubleBar also has some really great budget-friendly statement earrings as well.